Alfred Leslie Northey. Image courtesy National Archives of Australia. 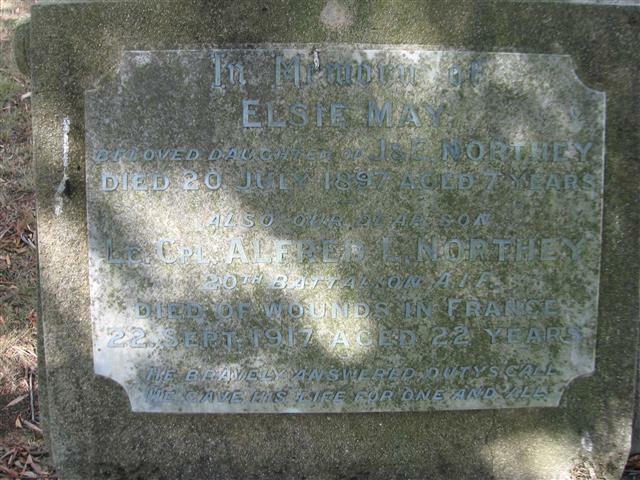 Alfred Leslie Northey was born in Millthorpe in 1895 to Joseph Thomas and Elizabeth Northey. The family later moved to Sale Street in Orange where Alfred attended Orange Public School. After his education Alfred worked as a telephone attendant at the Orange Post Office. In 1913 Alfred joined the railway department at Dubbo as a junior porter, a position he held for just over two years, until he enlisted for service in June 1915. Upon enlistment, Alfred stated that he was a member of 42nd Infantry Militia. 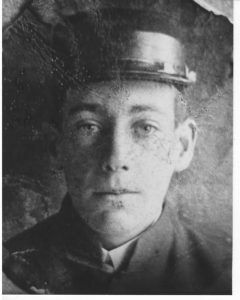 He was appointed to 20th Battalion 4th Reinforcements, D Company, embarking from Sydney in September 1915. After further training in Egypt the 20th Battalion proceeded to France to serve on the Western Front. In July 1917 Alfred was appointed Lance Corporal. Two months later, on 20 September 1917, Alfred sustained a gunshot wound to the chest when leading his men into the Battle of Menin Road Ridge near Ypres. He was admitted to the 6th Australian Field Ambulance and later transferred to the 10th Casualty Clearing Station, where he died two days later from his wounds. He is buried at Lijssenthoek Military Cemetery in Belgium. Alfred was 22 when he died; he had served for two years and three months. Lance Corporal Northey was one of seven men from the Orange district to die during the Battle of Menin Road Ridge. To his heart-broken relatives the sympathy of the whole district goes out, but in their deep sorrow they have the grand consolation that their boy died in the defence of his country – the noblest death of all. I was told by his relatives that he was reported as having died of wounds…but so far his name has not appeared in any casualty list. Alfred is a commemorated on the Orange Public School Honour Roll, Holy Trinity Church Orange Honour Roll and on his sister Elsie’s headstone at Orange Cemetery. His name appears on the World War I Roll of Honour on the southern face of the Orange Cenotaph and on panel number 92 on the Roll of Honour at the Australian War Memorial in Canberra. In 1923 the Anzac Memorial Avenue of trees was planted along Bathurst Road to commemorate fallen WWI soldiers. A tree was planted in honour of “Pte AL Northey”; it was donated by Fred Baker. Very few of the trees are still standing today. Alfred Leslie Northey memorial plaque. Image courtesy Orange Cemetery. This entry was posted on September 22nd, 2017.